How Much Water Should a 1-Year-Old Drink? Amanda Knaebel is a self-professed gadget geek and loves all things tech, both new and old. Amanda has been working as a freelance writer for over 10 years on topics including technology, health, fitness, nutrition, gardening and many more. She has also worked with Fortune 50 tech and financial companies, both in technical support and content production. Babies under a year old get most of the fluid they need from breast milk or formula, but after your child's first birthday, start making water a part of his daily routine. He'll still drink milk and possibly juice daily, but offering water regularly will help him get accustomed to the taste, so he'll be more likely to quench his thirst without always demanding a flavored or sugary beverage. Children between 1 and 3 years old require about 44 ounces of fluid per day, according to midwife and breastfeeding counselor Jennifer Hor in an article for BabyCenter.com. This doesn't mean your toddler needs to drink that much water every day, however. About 20 percent of your child's daily fluid needs come from food, and a 1-year-old should drink between 16 and 24 ounces of milk per day. This means that an average 1-year-old needs to drink roughly 11 to 19 ounces of water per day. 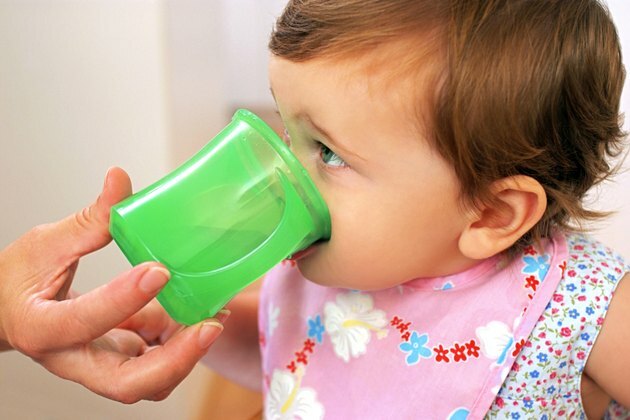 A good way to help ensure your toddler's meeting his daily fluid requirements is to offer milk with his meals and water during other times, advises pediatrician Dr. Jennifer Shu. Try offering water in a training cup or straw cup to give your child independence. This might make him more receptive to drinking water if he's having a difficult time accepting it. A 1-year-old may not be able to tell you when he's thirsty, so try offering him a small amount of water every hour he's awake and when he wakes during the night. Keeping your child hydrated can be a challenge in hot weather or during illness. Offer your toddler more water during hot weather, particularly if you're outside. Serving water chilled in the refrigerator or with ice might make him more likely to drink it in warmer weather. Monitor your 1-year-old's diapers and make sure he's urinating at least every six to eight hours. Take your child to the emergency room if he shows any signs of severe dehydration, such as sunken eyes, dizziness, excessive sleepiness, or cold or splotchy hands or feet. Drinking water provides several benefits for your child. It helps reduce the risks of constipation and urinary tract infections. Offering water in place of juice or other high-calorie beverages helps toddlers maintain a healthy weight and flush waste products out through urine. Your 1-year-old still needs the calories, fat and nutrients he gets from milk and solid foods, however, so limit the amount of water he drinks if you find he's filling up on water and won't drink milk or eat his meals and snacks. CNNHealth.com: How Much Water Do Babies Need to Drink? BabyCenter: How Much Water Should My Toddler Drink Every Day? Should I Wake up My Child at Night If He Has a Fever? What Is a Meal Plan for a 14-Month-Old Child?